Few things can top the feeling of celebrating the holidays with your family and friends by your side. 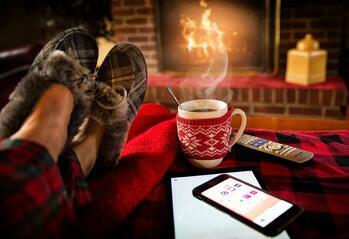 While you’re on the road — either traveling to visit family in another city or on a travel assignment — it might seem a bit more difficult to enjoy the holidays as usual, but there is still plenty of opportunity to make your temporary residence feel like home. Follow these tips, and you’ll soon discover the holidays are only as exciting as you choose to make them. Traditions are part and parcel of every holiday, so replicating them to the best of your ability while on the road is a great way to induce some cheer, get yourself into the spirit, and make your “home away” really feel like home. Psychologists like Michele Brennan note that adhering to traditions are an essential part of how humans bond with friends and family. Going through your usual holiday rituals can give you a feeling of closeness with your loved ones, even if they aren’t there with you. With that in mind, you should kick off the holidays as you normally would if you were at home — with some seasonal decorating. 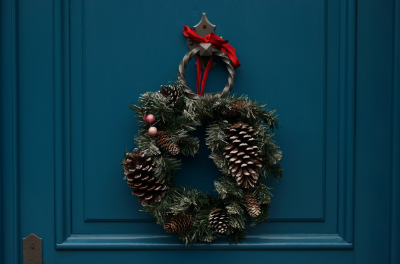 Get some candles, lights, ornaments, and other holiday decor to hang around your living space, and don’t forget to adorn your door with a beautiful wreath to solidify your holiday atmosphere. When you’re through decorating, consider indulging in other typical holiday activities: cooking some of your favorite meals, creating flashy holiday cards to send to friends and family across the country (or world), and whatever else you normally do to make the season feel festive. The idea here is to achieve some normalcy — so do it in whatever way feels most comfortable to you. Without the bonds of friends and family, the holidays lose much of their special luster. You might begin to feel lonely if those you hold near and dear aren’t around, so to combat that, you should schedule plenty of time to reach out and stay in touch around the holiday season. You can call, of course, but if you’re able, try a video chat instead. Seeing your loved ones’ faces while reminiscing about old times and future plans can help make the conversations that much more memorable and do wonders for your morale at a point when you might be feeling like you’re all by yourself. And while it may feel like you are alone on assignment, remember that the Triage community is at your fingertips. Be sure to explore our many Facebook communities, where you can connect with other travelers in your area. These groups offer a great forum to set up a sort of “Friendsgiving” gathering or schedule a fun holiday light tour. While it’s important to participate in your own holiday traditions, that doesn’t mean you can’t take the time to incorporate some new ones as well. No matter where holiday travel or an assignment may have taken you, you can be sure there are some local customs for you to explore and enjoy, and you should seek them out if possible. Wherever you find yourself on assignment, explore the community, discover what the locals like to do, and then follow their lead. You’ll find it’s almost a surefire way to have fun during the holidays. Celebrating the holidays when you’re away from home doesn’t have to be difficult, and neither does finding a great job as a traveling medical professional in the healthcare travel industry. Be sure to check out our job search page to learn more about the wonderful opportunities that are out there and the many benefits that come from working with Triage Staffing.